I really love any idea to add any sort of public transportation to St. Louis, but this particular idea just seems silly to me. Joe Edwards wants to run a Trolley from the Missouri Historical Society in Forest Park, to Kingsland and Delmar at the far western end of the Delmar Loop. Both of these locations are in close proximity to a Metrolink station. Consecutive Metrolink stations. The history museum, according to Google’s Walking Directions Beta (which doesn’t really get the walking route right but does provide a good distance estimate in my opinion), is .2 miles away from the Metrolink. A 3 minute walk. If they were really serious about adding something beneficial to the city and not just attracting attention to the loop, this is not the route they would have chosen. I think that the choice of the history museum as one end of the “Loop Trolley” is because the planners of this project think of the trolley as an exhibit for the history museum and site for tourists to see in the loop, not as an addition to our city’s useful infrastructure. On the other hand I really do like the idea of a Loop Trolley. Not too long ago I lived close to Metcalfe Park, not far from the western end of the Loop. I enjoy using Metrolink to get around and was pleased to be in an area in which I could walk to a station (3 in less than 15 minutes each), but I still complained about the walk and really wished I could hop on something like a trolley and get to the Metrolink station (or home from it). I commuted to work Downtown on Metrolink for a while and would often dread the walk down Delmar to the train, but in actually making the walk I would always enjoy myself the whole way and found that the real problem was getting distracted on the walk and being late for the train! This walk will be more enjoyable when more buildings and businesses are added around the station (which I really believe will happen soon). It does seem counterproductive to simply complain about the current plan and not propose anything better, but lots of people have proposed plans for extending this trolley and I enjoy complaining. I must concede that this plan could be a wonderful thing for the stretches of Delmar and DeBaliviere that would be served by the trolley but the scope just seems too small to justify such a large expense. A project like this failing would really set us back in making real improvements to a system of public transportation which badly needs them, and a need to make visiting opposite ends of the loop easier could be solved by increasing the frequency of MetroBuses. Maybe this project could be combined with Paul McKee’s NorthSide Trolley and turned into something more substantial? Also, WashU Students seem to have voiced opinions similar to mine in comments on this article. Thanks for the linkage! I have added you to my blogroll. Keep up the good work! As for the trolley proposal, I think it would make sense to build off of its novelty and likely popularity out of the gate and propose extensions really early on. I see the Loop Trolley as the “gateway drug” to a streetcar addiction in St. Louis. It’s a roundabout way of saying I support it (for the wrong reasons), but I just don’t see in-street fixed rail coming to St. Louis in the next 10 years in any other form. Imagine an extension of the Loop Line down Delmar, Lindell/Olive, etc. Hey thanks for commenting and adding me to your blogroll. I was super excited to see you had added me today while I was surfing the web at work. I also agree with you that any chance we have to start developing a streetcar system is a wonderful opportunity, I just wish there was more openness to new ideas in the planning process. I can’t remember where I read it, but someone proposed sending the trolley up around the North Loop area via Vernon, which would be a great way to make the system more useful without deviating too much from the original plan. Anyway, thanks for everything! I agree with Matt that the Loop trolley could be a great start toward a rebirth of trolleys, and more use of public transit. 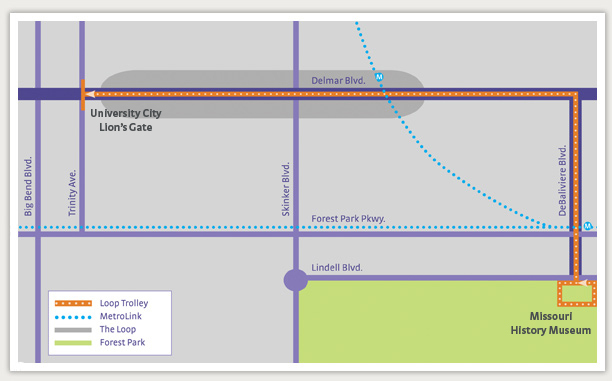 As I understand Joe Edwards’ idea, the trolley would connect with the two Forest Park area Metro stations, and it could make it easier for people to shuttle among the Loop, the park, and Metrolink. Thanks, stlexplorer, for getting people thinking about recreating and enhancing the excitement of urban living in St. Louis! Thanks for commenting Dad. I really support any investment anyone wants to make anywhere in the city, but “connect the two Forest Park Metro stations?” That is exactly what the project is doing, but the stops are already connected. By Metrolink! We already have 4 stops in the vicinity of this project: Big Bend and Forest Park, Skinker and Forest Park, DeBaliviere and Forest Park and the Delmar Loop. I’m not saying that we have too much, but that there are so many places that this could go to better use. Then again, it would be nice to extend the line down Delmar to the north side of the Central West End and even to Grand Center or Downtown.